Left to right: Tej Nuthulaganti, director, Health Workforce, Clinton Health Access Initiative; Arvin Anoop ’18; Yijiao He ’18; Kristina Talbert-Slagle ’10 Ph.D., assistant professor of general internal medicine; Dr. Bernice Dahn M.D. M.P.H., former minister of health, Liberia; Serene Silin Li ’17; Attila Yaman ’16. A half-dozen Yale students and faculty members recently met on campus with Dr. Bernice Dahn, the former Liberian Minister of Health, to discuss implementation recommendations by Jackson Institute student capstone groups to improve healthcare in the West African nation of Liberia. The groups’ work began more than three years ago when the Yale Jackson Institute for Global Affairs approached the Yale Global Health Leadership Institute (GHLI) to propose a capstone course related to global health. The senior capstone project allows global affairs majors to gain public-policy experience. GHLI agreed to move forward with the project and nine seniors in the Jackson Institute’s Global Affairs program enrolled in the first course, providing them with an opportunity to assist a real-world client in Liberia. Dr. Dahn was the Minister of Health of Liberia throughout its deadly Ebola outbreak and has been a key architect of plans to rebuild the country’s health system. The initial group and two subsequent capstone groups worked for the Clinton Health Access Initiative in Liberia and then directly for Liberia’s Minister of Health. Their work has supported Liberia’s efforts to improve medical education at A.M. Dogliotti College of Medicine (AMD), the only medical school in the country, and to strengthen the country’s health workforce. After the project was approved in 2015, Dr. Kristina Talbert-Slagle, assistant professor of general internal medicine at the Yale School of Medicine (YSM), was named the course instructor, and Tej Nuthulaganti, director of health workforce programs at the Clinton Health Access Initiative (CHAI), joined as a client. Dr. Talbert-Slagle, as the course instructor, met weekly with the students, assigned readings, facilitated communication with CHAI and Dr. Dahn in Liberia, and oversaw development of the students’ final product. The capstone team determined that the project would focus on strengthening the health system of Liberia, where Yale and CHAI had been working together to build capacity in health management since 2008. Liberia, a small country on the Western African coastline, is emerging from an Ebola epidemic that overwhelmed its healthcare system. It currently has one of the world’s lowest physician-to population ratios. The World Health Organization (WHO) recommends a 1:1,000 doctor to patient ratio for adequate healthcare service, yet according to a 2016 report by the Liberia Medical and Dental Council, the country has just 298 medical doctors to care for that country’s 4.5 million population, a doctor/patient ratio of 1: 15,000. 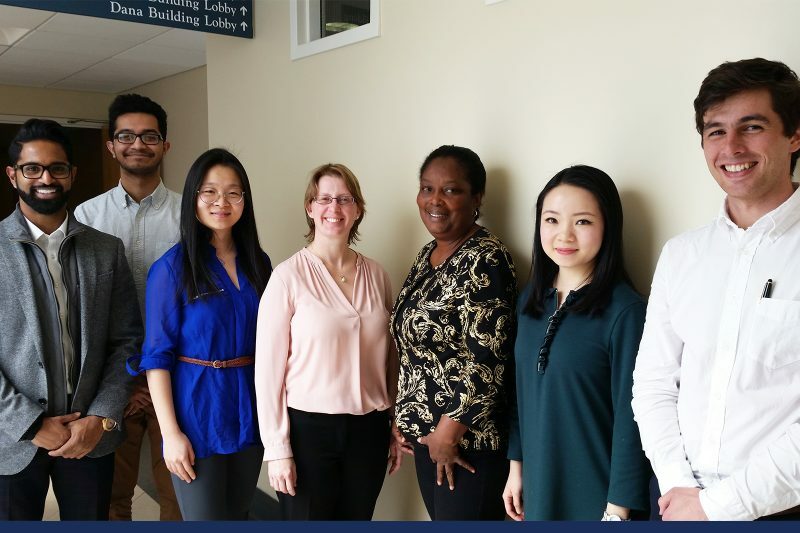 “The Yale capstone project was vital in establishing the evidence needed to convince partners and policy-makers to effectuate larger changes needed in Liberia’s sole medical school,” said Nuthulaganti, CHAI. “Yale has made a profound concerted effort in conducting multiple capstones in Liberia which has allowed for deeper government relationships and immersion in local context instead of one-off projects that have less impact. “With Yale’s deeper, longitudinal experience, the course has been structured in a way that sets Yale apart from other institutions trying to create similar experiences for organizations and students. This has been a win-win for our work in Liberia and for the students with this rich experience,” added Nuthulaganti. Beginning in 2015, Talbert-Slagle’s students developed a report that explored lessons learned from past health management programs conducted in other African countries like Rwanda and Ethiopia to inform work in Liberia. Yaman added that a health management certificate program at the University of Liberia is in the works based on the 2015 report, and his current work with AMD continues to be informed by the reports of subsequent capstone classes. In 2016, the Yale team created another report that featured an analysis of the needs and challenges faced by AMD along with recommendations for improvements. According to Serene Silin Li (YC ’17), one of the students involved in researching and developing the 2016 report, the team felt it was crucial to ensure the voices of AMD students and instructors were prominently represented during the process of investigating the situation at AMD. “From learning environment, living situation, school infrastructure, finance and budgeting, our team made an effort to tell the comprehensive story and offer practical solutions, in the hope that some fellow student’s life could be improved in the near future,” said Silin Li. In 2017, the capstone class built upon all previous findings to recommend locally appropriate approaches to enable financial sustainability in medical education. As with previous reports, the 2017 findings were built from information gained by numerous interviews and surveys. The 2017 capstone students also gathered financial data from the medical school and the University of Liberia, and conducted comparative analyses of how other medical schools in West Africa and globally charge tuition, increase revenue, and reduce costs. They developed a financial modeling tool to enable comparison of different medical education structures and tuition models for Liberia’s medical school. After completing all this work, evidence-based recommendations, including suggested strategies for increasing revenue generation and reducing costs, were shared with Dahn. Talbert-Slagle said that originally the project team had intended on recommending small, incremental changes toward helping AMD move toward financial sustainability, but as the work progressed it became clear that much larger, more substantial changes would be necessary. One major challenge in Liberia is that many students who would like to pursue an M.D. cannot afford to pay for medical school. The Government of Liberia has tried to subsidize medical education for students, but since the government is also extremely resource-constrained, providing free medical education for all has proved untenable. As such, a central focus of the project was to make tuition fees more accessible. The capstone students proposed a need-based financial aid model, and other ideas for finding alternative sources of revenue to offset the need for tuition, such as alumni donations and supplementary degree programs. Capstone students also explored and provided specific details and recommendations for several other options for revenue generation for the medical school, such as establishment of an endowment, and running a capital campaign to enable establishment of scholarships so that low-income, high-potential Liberian students could still attend medical school for free. The University of Liberia, which houses Liberia’s medical school, also contains many other departments and schools. All finances for the medical school are managed centrally at the university, causing complicated, time-consuming processes and added bureaucracy for budgeting and finance management. The capstone class recommended making the medical school financially autonomous from the university, allowing revenue generated through tuition and other approaches to be managed directly by the medical school. Dr. Dahn is now spearheading an effort to implement this change. Talbert-Slagle affirms decentralization of financial management was a key finding of the various capstone groups. Anoop added that decentralization will empower AMD to experiment with some of the models that have been suggested and ultimately find one that works best for the students, the school and the country. “It will also encourage the school to invest in data management and gain a better understanding of past and future financial projections, which is critical to measuring outcomes from the restructuring,” said Anoop.